The mission: to spread the truth about the Holocaust – the Shoah – in the Middle East, the 21st century anti-Semitism hotbed. To raise one million US Dollars to translate the book: “Humanity NOT” into at least 12 languages. The background story: The holocaust, some call this phenomenon Genetic Terrorism and some call it Banality of Evil, is indescribable; there are no words, in any language, to describe what the Nazis did to 6 Million Jews. The Persian Language, known as Farsi, is the most widely spoken member of the Iranian branch of the Indo-Iranian languages, a subfamily of the Indo-European languages. It is the language of today’s Islamic Republic of Iran (formerly Persia) and is also widely spoken in Afghanistan and, in an archaic form, in Tajikistan and the Pamir Mountain region. Until Dr. Ari Babaknia took action, there was not one reference book about the Holocaust, in Farsi, a language spoken by 150 million people. Though he was a busy practicing physician, for his own interest he read few books about the Holocaust. Then one sentence changed Dr. Babaknia’s life and his view on the subject, about the indifference to the Holocaust. The word COMPLICITY cut sharp through Dr. Babaknia’s brain; his mind could not grasp what his ears just heard. He understood that Clinton knew what the people did not know. It was 50 years since the war ended and information about the war was going through the president’s office for declassification. Dr. Babaknia received his clearance, and for four months, following Clinton’s speech, he spent time in the national archives, searching for what really happened in those darkest days. He was able to find several hundred papers referencing the Holocaust. The papers showed that the U.S. War Department, the State Department, the American media, the American people were not ignorant about what was taking place across the ocean in Europe during the years when the Holocaust was in the making. It was all a willful indifference, not willful ignorance. President Clinton, Elie Wiesel and many other people call it complicity. Dr. Babaknia decided to share what he knew with the world. He took a year off from his medical practice to extend his research on the subject. Already during the mid ’90s, he found that there were more than 50,000 books, in English, about the Holocaust, but there was not even one book about the Holocaust in Farsi. His first priority was to write his book in Farsi, but help to complete the project was scarce. While Dr. Babaknia was still researching, Mahmoud Ahmadinejad became the president of Iran and in his rhetoric he publicly denied the Holocaust on every possible occasion. The idea of writing a book on the Holocaust in Farsi became an immediate necessity to many, and the help Dr. Babaknia needed came fast. What disturbed Dr. Babaknia a great deal, and to which he dedicated a large portion in one of the volumes was the Americans – from President Roosevelt and the State Department to the media – involvement and reaction, or lack of, to what was taking place in Europe; the failure of a timely rescue by the American leadership, and that includes the American Jewish leadership – headed by Rabbi Stephen Wise, who, in his selfish and misguided inaction, failed to rise up to rescue his fellow Jews of Europe. In his book Dr. Babaknia does not forget to mention the most untimely White Paper, imposed by the British government, on May 23rd 1939, four months before WWII broke, on September 1st 1939; the decree restricted the entry of Jews into British Mandate Palestine. Had the White Paper been canceled, opening the gates to Palestine could have saved untold numbers of Jews from being murdered. But the flow of Arab oil was more important to the British than stopping the flow of innocent Jewish people’s blood. In addition, the book dealt with the rather conveniently obscured history about Switzerland’s collaboration with the Nazis. The fact is that without the assistance of the Swiss government and the Swiss banks, the war could have ended 18 to 24 months earlier. The Germans ran out of money, their money became valueless and they could not get any help from outside, other than from Switzerland, and thus many more people were murdered. Not omitted from the book is what Catholic scholars call the criminal role of Pope Pius XII before, during and after the Holocaust, when he helped more than 10,000 Nazi criminals to flee Europe safely and with dignity. In the last volume, Dr. Babaknia writes about other, modern time genocide, the Armenian, Bosnian, Rwanda and Darfur, some are Moslems killing Moslems, but genocide all the same. With the writing of the book, Dr. Babaknia gave Moslem society the opportunity to discuss the Holocaust, a most unfamiliar subject to most Moslems. 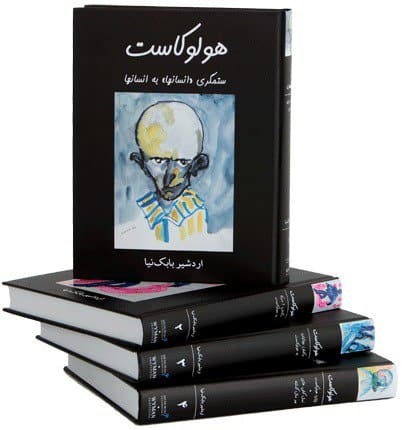 Now that there is awareness about the Holocaust among Farsi speaking people, the book could not only educate the people about the Holocaust but dismiss the lies Ahmadinejad propagated about it during his presidency. For his second, most impressive coffee table book, Dr. Babaknia is seeking the public’s involvement. He tells an interesting story about the making of the book. In 1985, a Moslem Iranian artist called his office, in Irvine California, declaring he had Parkinson’s Disease and he was dying. Dr. Babaknia invited the man to his home and for four months his conducted some clinical trial treatment on the man and the man completely recovered. In gratitude, the man asked Dr. Babaknia what he can do for him. Since publishing a book about the Holocaust was in his futuristic planning, Dr. Babaknia asked the artist to paint for him few painting relating to the subject. After two years of work the artist submitted to his doctor 300 paintings, each one portrays a subject matter about the emotions and ethics of the Holocaust. The book, he named, Humanity NOT, is a compilation of evidential stories about the Holocaust, which Dr. Babaknia collected during the research years he conducted on the subject. Each story is matched with a painting, 300 amazing painting matching 300 amazing stories. 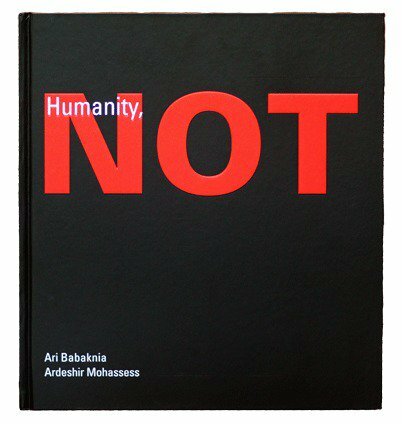 The goal is to make the book “Humanity NOT” available to every student in the world almost for free. Each book will end up costing $20,00 and thus, those who carry the NEVER AGAIN torch must help subsidize the effort of this book. In addition, the book will be translated from English into the first twelve other languages, which are Farsi, Arabic, Hebrew, French, German, Spanish, Italian, Turkish, Portuguese, Russian and Polish. The book will eventually become available on DVD, each story read by a famous artist or personality. Surprisingly, there is not one well-documented book about the Holocaust in Arabic and Dr. Babaknia is working to make sure that changes as well. This entire project is about speaking up for the 1.5 million children who had no voice and whom the Nazis killed. It is about keeping the memory torch aflame and keeping the memory and the story alive, all on behalf of these 1.5 million innocent children. 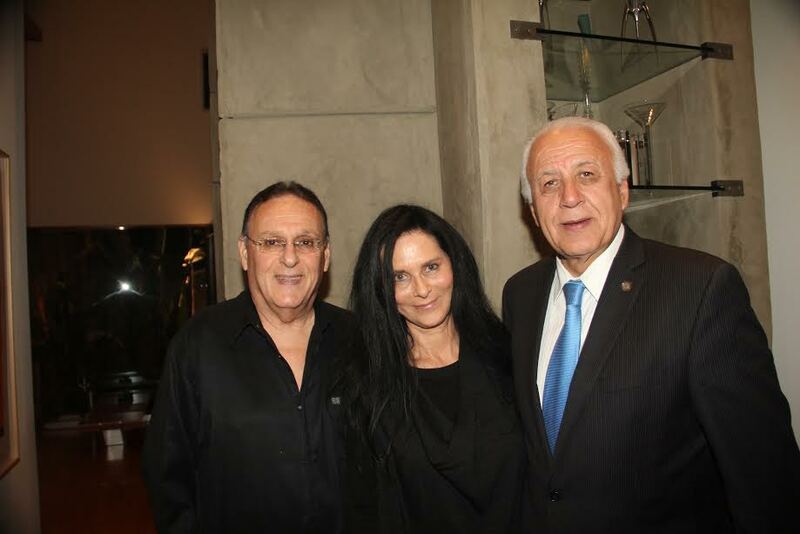 This project has expanded, much too big for one person; Dr. Babaknia needs help from all four corners of the earth to tell the story about the Holocaust as it was never told before in other languages; to help spread this truth is to become part of the project. The Holocaust was a human tragedy like no other. It was the death of human conscience, it was the failure of Democracy. Sadly, today Europe is regressing to the pre 1938 era, and anti-Semitism, that brought about the Holocaust, is on the rise in the evil European continent and many other spots on earth. Jews do not own the Holocaust, they were its victims. Humanity owns the Holocaust. The Jewish nation lost 1.5 million children who never got the chance to grow up and to contribute to their Jewish nation or to humanity. They never got the chance to become adults, to procreate and create the next generation of Jews. To make sure it never happens again, the duty of the generation, born to the surviving victims of the Holocaust who are now fast expiring, is to make sure, in words and deeds, that humanity does not ever slip into making such an atrocity happen again. Dr. Ari Babaknia is a man of valor, we can all be of his like.